There is an ongoing interesting exchange of emails on dad-net (the Domestic Animal Diversity network—accessibility pending on membership), which followed the publication of a recent article on BBC regarding the involvement of the Bill and Melinda Gates Foundation in poultry production. The International Livestock Research Institute (ILRI) is fortunate to work with the foundation on a project of relevance here, the African Chicken Genetic Gains project (ACGG). 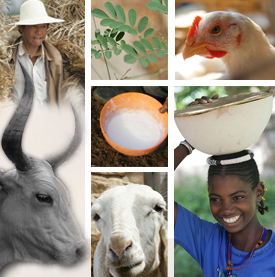 It is important to remember that ILRI as a CGIAR institute is governed by and adheres to all of the international conventions and treaties governing biodiversity. Our research on forage biodiversity is governed by the International Treaty on Plant Genetic Resources for Food and Agriculture. Similarly, our research on conservation, utilization and promotion of indigenous livestock resources—part of our research mandate—is conducted within the relevant treaties and conventions and within the CGIAR policies and guidelines. Our research has helped to highlight the importance of indigenous livestock genetic resources. We fully recognize and value the communities and the farmers owning these livestock as the custodians of the livestock diversity—they are our partners in this research. The ACGG project in this respect is a fantastic opportunity to document the importance of indigenous poultry and to examine them critically compared to exotic lines. Briefly, the project involves three countries: Ethiopia, Nigeria and Tanzania. It has multiple components including the testing in each country (productivity, resilience, survivability) of an improved local indigenous ‘breed’, as well as exotic ‘breeds’, on station and on farm. The project will generate a large amount of data which will allow the performance of both types to be documented. While this has been done on a limited scale in the past, to our knowledge it has not been carried out so extensively and in so many different agro-ecological zones. I invite you to visit the website for further information. ACGG is also a catalyst for other poultry projects that the dad-net community may be interested to know about. Together with partners, we aim to test and further develop protocols for the collection and preservation of germ cells including from indigenous poultry populations. This activity is just starting, but in due course scientific outputs will be shared and made publicly available. It is an important element of our strategy for the conservation of indigenous poultry. African livestock production systems are changing rapidly and there is no doubt this is impacting local livestock, it is threatening as well as it is creating new opportunities for indigenous livestock resources. It is our responsibility to capitalize on the latter while minimizing the impact of the former. I hope this will bring some clarification on some important generic issues raised by some of you following the publication of this BBC article. Olivier Hanotte, scientific advisor at ILRI, on behalf of the ACGG team and ILRI. Tags: Bill Gates, DAD-Net. Bookmark the permalink. This is a very good clarification that will be of immense benefit to the international audience. Please keep it up. Hey how are you dear friends. I’m a new young farmer from Africa live in Israel. But I wanna invest my poultry in Africa. Specially just kuroiler breeds. We are 2 people me and my partner he lives in us. So I may ask please to replay me and tell me how can we get pure kuroiler chicks. We both need 2000 chicks. =4000 chicks. We decide to have them from Uganda Coz the quility is Metter. Dear Issiaka, this email is in response your post on ACGG website. Thank you for taking interest to invest on poultry production in Africa and writing to us. As you might have understood from our website, the African Chicken Genetic Gains (ACGG) project is evaluating (for a duration of 72 weeks) under farmers’ management and experimental conditions the egg productivity and growth performance of certain chicken strains/breeds. At this point in time, the test has not been completed and we are not confident to recommend any particular chicken breed or supplier for small scale producers. Yes, Uganda can be potential source for the Kuroiler breed.